Why does this star have so few heavy elements? 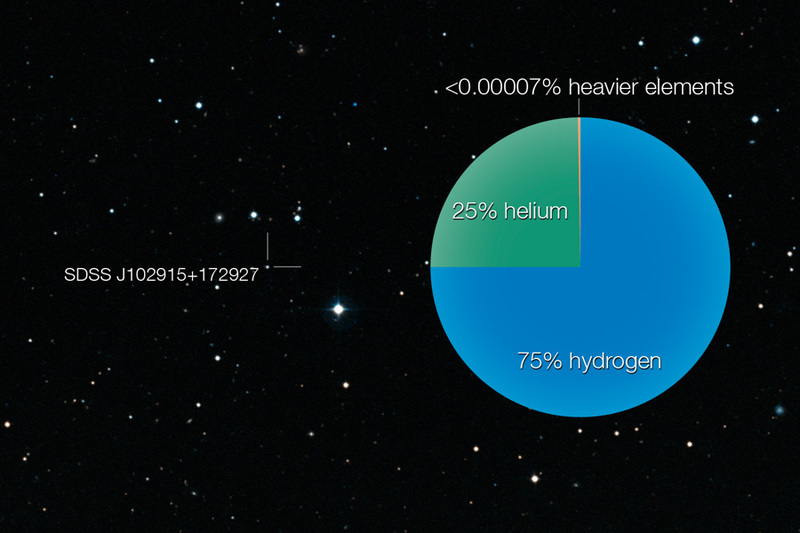 Stars born in the generation of our Sun have an expected abundance of elements heavier than hydrogen and helium mixed into their atmospheres. Stars born in the generation before our Sun, Population II stars, the stars that created most of the heavy elements around us today, are seen to have some, although fewer, elements heavier than H and He. Furthermore, even the elusive never-seen first stars in the universe, so-called Population III stars, are predicted to have a large mass and a small but set amount of heavy elements. Yet low-mass Milky Way star SDSS J102915+172927, among others, appears to have fewer metals than ever predicted for any stars, including at least 50 times less lithium than came out of the Big Bang. The unusual nature of this star, initially cataloged by the Sloan Digital Sky Survey (SDSS) and pictured above, was discovered by detailed spectroscopic observations by a large VLT telescope in Chile. Many models of star formation indicate that such a star should not even form. Research is ongoing, however, with one leading hypothesis holding that fragile primordial lithium was destroyed in the star’s hot core.